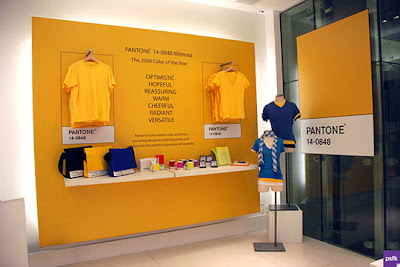 If It's Hip, It's Here (Archives): Pantone Continues Their Colorful Collaborations With A GAP Pop Up Store. 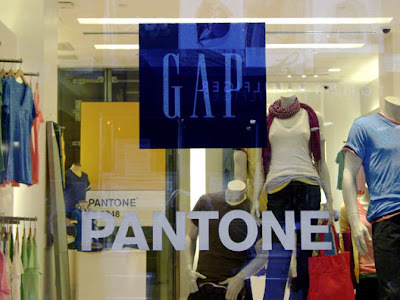 Pantone Continues Their Colorful Collaborations With A GAP Pop Up Store. 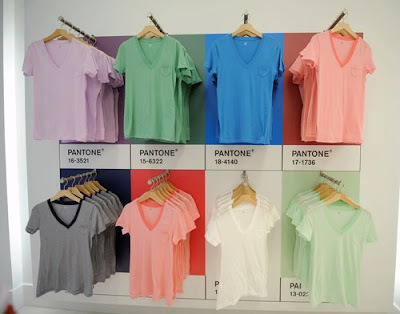 Last weekend Gap and Pantone opened up a pop-up shop on 5th Ave in the company’s ‘concept store’ space. The shop is selling t-shirts in a range of Pantone hues. 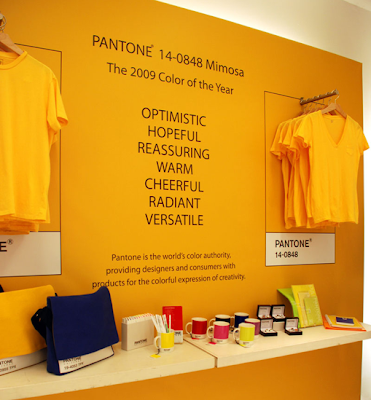 Pantone recently unveiled its pick for the 2009 color of the year called Mimosa (#14-0848). Pantone describes the color as having seven characteristics, optimistic, hopeful, reassuring, warm, cheerful, radiant, and versatile which they feel are the most relevant to the next twelve months. Gap has issued a Mimosa hued shirt that is only available at the store on 5th. 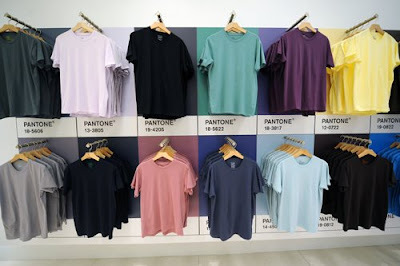 If Pantone t-shirts sound familiar, yes they have been done before by Uniqlo. (Along with lots of other collaborations you can read about here, here and here). 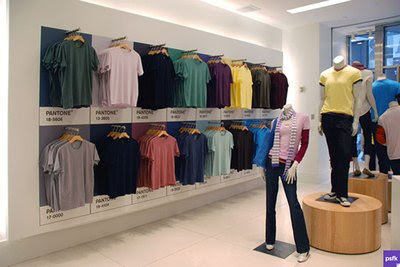 The shop, now thru February 8th will feature a full palette of Gap tees from Gap’s upcoming spring collection in true PANTONE Colors, including a limited-edition tee in Mimosa, Pantone’s color of the year for 2009, available only at the Gap & Pantone T-Shop. Alongside Gap men’s crewneck [$18] and women’s v-neck [$18.50] t-shirts, the shop will feature a display of PANTONE UNIVERSE(TM) items, including a collection of color-themed stationery, office supplies, books and accessories. Pantone, an X-Rite company (NASDAQ: XRIT), is the global authority on color and provides professional color standards for the design industries. The Mimosa tee is available in limited quantities as a men’s crewneck [$18] and women’s v-neck [$18.50]. Mimosa is also one of the 3,000 colors available in Pantone’s line of superior-quality, eco-friendly paint. Store Hours: Monday – Saturday: 10:00 a.m. – 9:00 p.m. | Sunday: 11:00 a.m. – 7:00 p.m.
special thanks to PSFK and Lint Coat for images and info. If you like Pantone related items, have I got Pantone products for you! Cool and geeky. Too bad the fabric people can't control their color better. Those missed colors would never fly in the print world. Many aren't even close.